Material on this website, including text, images, and audio/video media is protected by copyright law and is copyright to BedBug-Answers.com, unless credited otherwise. It may not be copied, reproduced, republished, downloaded, posted, broadcast, or transmitted in any way except for your own personal, non-commercial use. 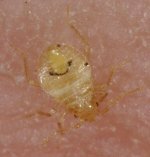 Quoting this site is welcomed and encouraged, as long as the quote is properly attributed to BedBug-Answers.com with a link back page that was quoted (preferred) or a link to the site's home page at a minimum. Reasonable effort has been made to ensure that all images and videos displayed on this site are properly licensed. BedBug-Answers.com takes no responsibility for user uploaded content. Images on this site that are in the public domain (PD) or licensed under Creative Commons (CC) are noted as such. All other images are privately licensed or are original content. We take copyright violations very seriously! If you are the copyright holder of any audio/visual media displayed on this site, and you believe your rights have been infringed upon, please contact us using the form below.